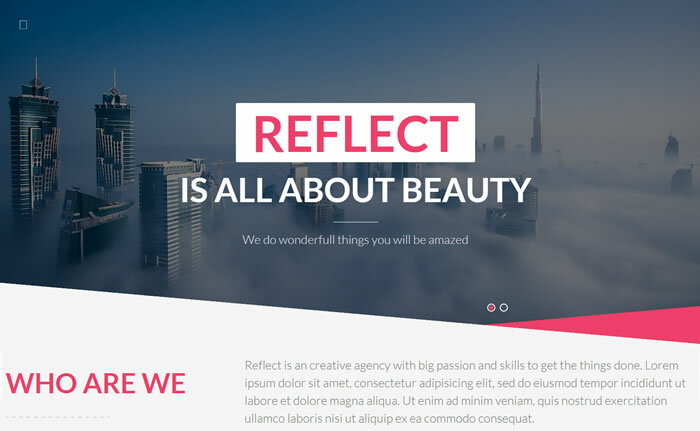 Reflect is very impressive creative one page WordPress theme contains unique body design, built based on bootstrap 3 framework with 1170px pixels grid wide layout. Featured with vertical navigation menu makes navigation quicker without leaving the view port. Enabled with powerful theme options panel powered by Redux Framework and built with LESS CSS pre-processor files helps you to load website so faster. Reflect creative one page WordPress theme bundled with Visual composer (worth $28) drag n drop page builder and enabled to support parallax backgrounds, CSS3 onscroll animations. Its Valid HTML5 / CSS3 compliance premium WordPress theme included with 800+ icon fonts and 600+ google web fonts. Reflect is search engine friendly, cross browser compatible WordPress theme bundled with XML demo content.